If you feel stuck in your work, I believe one of the most transformational experience you can give yourself is through travel. Mindy Hu shares how she was inspired to launch her own business after a fairly impromptu trip to Antarctica. Now she wants to teach you how to find a business idea by traveling. 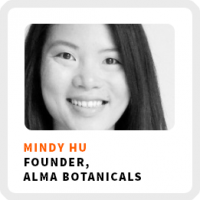 Mindy is the founder of a truly natural skincare company, Alma Botanicals. Currently, it’s her side hustle. By day she’s the director of operations and strategy for Epicodus, a coding academy. Learning the value of downtime and introspection through traveling. How Mindy teaching herself through trial and error to develop her products and her business. Testing advertising messages by using different hashtags on Instagram. How she juggles a full-time job and a side hustle. Ideal work environment: In the mornings, with a clear goal, but also with flexibility in how she achieves that goal. Superpower: The ability to understand someone by just talking to them briefly. Definition of success: Being able to turn her passion into a business and share her story every day with individuals. Regains focus by: Taking some alone time to recharge her batteries. 90-day goal: Get into more brick and mortar locations in Seattle and get out into the community more. 1) Don’t plan every detail. Go with an open mind so that you can take the opportunities that come up. 2) Keep it flexible and embrace the journey. 3) Take time to reflect on your experience and understand your achievement.